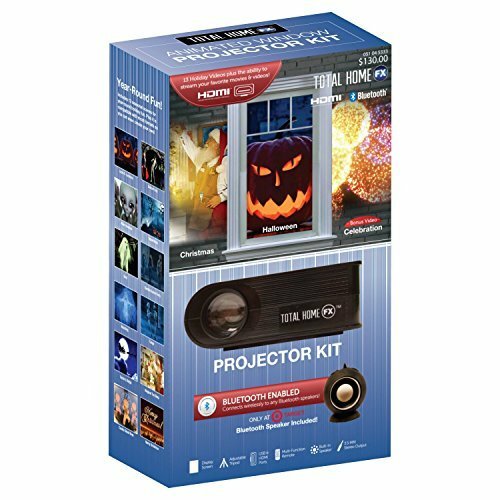 Dazzle your neighbors and guests by creating a jaw dropping holiday display with use of the Total Home FX Projector Kit. HDMI and Bluetooth capable digital projector is preloaded with 12 video files with various holiday and celebration themes such as Christmas and Halloween. Simply hang the included screen from inside your home over any window of your choice and position the projector (indoors) at the window. Then watch as unsuspecting neighbors pass by and get a glimpse of what's going on "in your home"! Although the projector is positioned indoors, passersby will be able to see your unique video display from outside your home! The projector's HDMI capability also allows you to stream your favorite movies or media in addition to the pre-loaded video clips. Kit comes with everything you need to get set up for a spectacular holiday- 1 digital projector, 1 nylon screen, 1 flexible tripod, 1 remote control, and 1 3-Watt Bluetooth Speaker. Ability to stream your own favorite movies or media! If you have any questions about this product by Total Home, contact us by completing and submitting the form below. If you are looking for a specif part number, please include it with your message.